Moms Club: Looking for a support group that understands your experience as a mother? Struggling with post-partum depression and long for a place to feel supported and connected? Seeking guidance through those challenging early years? Then Moms Club is for you! Parenting can make you feel like every day is your first day on the job. Just as your child completes one life stage, he or she enters another, leaving you wishing you had a mommy manual. The company of like-minded moms can help you through the difficult days, the parenting obstacles, and the celebrations of your child’s accomplishments. Of course, you can bring your child with you. You don’t have to hire a sitter to participate! Women Supporting Women Group Counseling offers a safe space where women can foster support for one another through mutual sharing and validation. In this confidential setting, the facilitator assists women in processing relationship challenges, emotional health and regulation, self-esteem, life balance, strategies for effective coping, and other topics unique to women. This group empowers you as we work together to create a supportive environment for personal growth through gaining a sense of control, improving coping skills, learning how to communicate your feelings, embracing your personal narrative, and feeling less alone, isolated, or judged. Thursdays at 7pm. Teen Counseling Group is populated solely by teens because peers are the most influential people in a teen’s development. While individual therapy remains an important component of our program, teens are often more open and honest in groups, and more likely to identify with the feelings and issues expressed by others that they may struggle to express. Topics range from depression, anxiety, medication management, peer pressure, bullying, emotional regulation, social skills, and self-esteem. Mondays at 4pm. Mental Wellness Support Group ​​encourages you to return to a life that you care about. Mental health symptoms create challenges and cause barriers to fulfilling life goals. This group works to improve your moods through group collaboration. Members work to change their old ways of behaving in favor of new, more productive, healthier patterns, while suggesting topics that meet both individual needs and those of the entire group. Through this process, you come to understand tangible techniques to manage the multitude of issues that will surface during your lifetime. An important first step is spending 20-30 minutes discussing your needs and expectations with the facilitator before coming to your first group session. Please contact us for additional information. Participants are often surprised by how rewarding this experience can be. Thursdays at 6:00pm. Young Women’s Support Group is designed for women ages 18-25. This eight-week program provides you with a safe, supportive environment to explore your hopes, dreams, and fears as you and your fellow group members transition through many life changes. The group creates a platform for you to share your experiences and learn from those of your peers, offer advice, receive support, and, most importantly, feel a sense of belonging. Topics include body image, healthy boundaries, how to create a supportive social network, confidence building, and strengthening communication skills. Thursdays at 3:45pm. Drug & Alcohol Outpatient Group Therapy focuses on relapse prevention, coping skills, codependence, boundaries, communication skills, and recovery monitoring. Addiction group counseling is a great space for accountability and support for reaching your recovery goals. 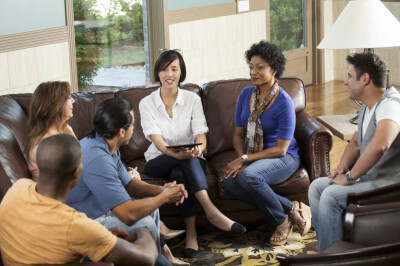 Group therapy creates a deeper sense of self-reflection and also teaches participants how to relate to others, challenge their perceptions, and rebuild relationships, which they may have struggled with throughout their addiction. Once a month, family members are invited into group therapy sessions so that they can hear the stories of others, receive support from group members, and have a platform to share their own feelings and experiences.